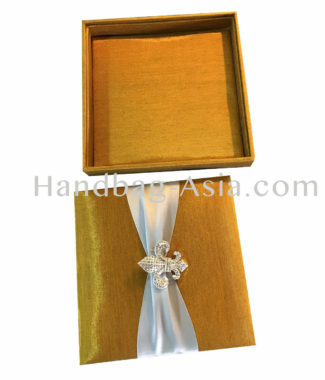 Our hand-crafted gate fold wedding box is very famous along brides worldwide. The doors are useful since cards or pictures can be easily placed inside the little pockets placed inside the doors. The padded exterior and interior simply looks and feels great. The rhinestone crystal used for the crown brooches are all A grade and real rhinestone crystal, imported from Europe. 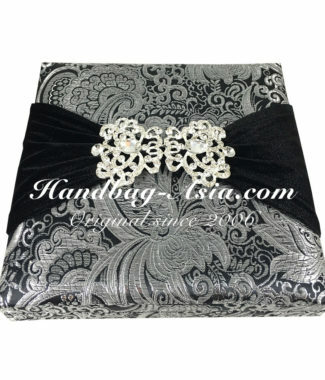 The silk is high quality silk from our local suppliers, it is a mix of faux and Thai silk which allows us to offer the boxes cheaper. if you need it even more luxury we can use 100% Thai silk or our pure dupioni silk instead, but it will cost a little more, too. This box comes in all imaginable sizes and over 200 colors which you can see on our color chart online. – Striuct quality checks and packaging in bubble wrap and thick carton boxes (100 pieces per carton box) makes sure that the high quality we manufacture is also delivered without damage.